Just about everybody knows about testosterone and estradiol, the rock stars of the hormone world. However, some of the "backup players," such as progesterone, as not nearly as well-understood by most guys. A lot of us think of progesterone as a "female hormone," but this is simply not true. After all, progesterone is the precursor to the critical downstream hormones cortisol and aldosterone in us males and raising and lowering progesterone levels can have a profound effect on many men. 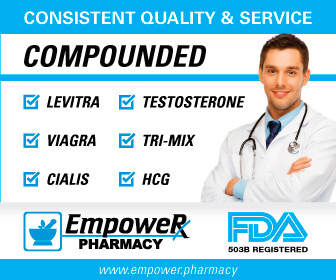 It can be just as powerful as testosterone in improving male general and sexual health, something I document in my links on Progesterone and Erectile Dysfunction and Progesterone in Men. As HRT (Hormone Replacement Therapy) has grown up and matured - actually, we are still in our infancy as far as understanding - some physicians and anti-aging clinics are experimenting with progesterone. Again, the results can be very powerful in some cases. Of course, the burning question is safety. Could long term progesterone use in men cause some kind of unforeseen negative issue? That is going to be a very difficult issue to answer definitively. Testosterone gets almost all the research for a number of reasons and background players like progesterone are seldom studies, especially in studies of men using them on a regular basis. This is why a physician (or naturopath) with a lot of knowledge and experience is critical with progesterone. Also, don't forget that you should never assume that you are low in a particular hormone just based on symptoms. Savvy doctors use a combination of symptoms and lab readings for their hormonal evaluations. This is no different with progesterone and, if your doctor will not test you for some reason, remember that you can check it out for yourself by simply going to my link Labs for Hormone Monitoring and Self-Testing. 1. DHT. Progesterone is a strong 5-alpha-reductase inhibitor, i.e. it tends to lower DHT (dihydrotestosterone) levels. Of course, many middle-aged and senior men struggle with the effects of DHT, especially male pattern baldness. And, yes, limiting DHT in some aging males could be of some benefit. However, as you can read about in my link on Testosterone and DHT, it is critical to libido as well. Many 40+ guys are low or lowish in DHT and reducing this further could negatively impact them in the bedroom. DHT also influences hypertrophy (muscle growth) and brain function, so some discretion is required. 2. Accumulation in the Fat Tissue. Dr. Mercola has noted accumulation of progesterone in the fat tissue in men taking some of the more concentrated creams. He recommends regular saliva monitoring of progesterone to make sure it is not building up in tissues. 3. Lack of Research in Men. Progesterone therapy in men has not been nearly as well-studied as testosterone therapy. There are a number of progressive physicians who have used it, but ideally that should really should be verified in some longer term studies before widespread adoption. Some argue that it should be safe as long as you restore to normal physiological levels. There are reports of progesterone regressing prostate cancer. However, prostate cancer is very tricky and, of course, a study should be undertaken to verify results. 5. Sedative Effect. Progesterone can have a relaxing effect. Unfortunately, anything that has even a mild sedative effect can have a negative impact on libido and/or erections. On the other hand, progesterone can improve sleep, which will generally help improve sexual function. The rebuttal to this argument is the fact that progesterone is being researched as a possible treatment for erectile dysfunction in some men. (See this link for more information. 6. Raise SHBG. Quite a few men have high SHBG, which lowers their free testosterone. Raising progesterone levels may raise SHBG even further and, thereforme, make their situation more difficult. 7. Prostate. Some experts believe that progesterone will be good for the prostate since it seems to control both estradiol and DHT. However, this is far from a certainty and has not been studied in even a small study (as far as I know). Furthermore, you can read about how it seemed to raise the PSA of couple of men in my link on Progesterone and Erectile Dysfunction. 8. Blood Pressure. Progesterone tends to lower blood pressure. However, if you are on blood pressure meds, this could potentially be an issue. 1) Psychoneuroendocrinology, Apr 2004, 29(3):339 354, "Administration of progesterone produces mild sedative-like effects in men and women"
2) The Journal of Clinical Endocrinology & Metabolism, Jan 1 1974, 38(1):142-147, "Inhibition of Testosterone Conversion to Dihydrotestosterone in Men Treated Percutaneously by Progesterone"
3) Clin Endocrinol (Oxf), 1980 Nov, 13(5):409-12, "Leydig cell tumour of the testis with gynaecomastia and elevated oestrogen, progesterone and prolactin levels: case report"
4) Plast Reconstr Surg, 2000 Oct, 106(5):1011-3, "Estrogen and progesterone receptors in gynecomastia"